A group of greedy archeologists break into a cursed Egyptian tomb with predictably disastrous results. Fifty years later, Samantha (Louise Lombard), the granddaughter of the lead archeologist (Christopher Lee), finds his notes and sets out to discover what really happened. She brings back the sarcophagus of Talos back to London. People start to die. Samantha discovers that thanks to a particular planetary alignment, the mummy has awoken and is taking the organs of people reincarnated from him. With the help of a cop (Jason Scott Lee) and some of the original archeology team, she sets out to stop Talos. 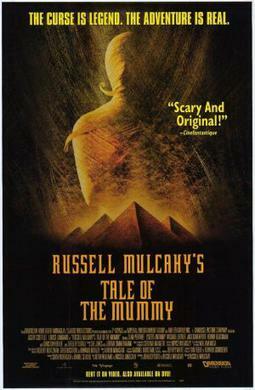 Tale of the Mummy takes one of the most iconic aspects of mummy movies, the bandages, and really runs with it. For most of the film’s run, Talos exists as a flying mass of bandages that chases its victims. Its a novel idea in a movie filled interesting twists on the mummy movie. I really like concept of a monster preying on its own reincarnations, one of which happens to be a dog. The movie is not wholly successful thanks to some poor cgi and dull lead actors. Christopher Lee and Shelley Duvall make brief appearance to liven things up, but it’s not enough to raise the movie above a direct-to-video level of quality. The end is confusing, and the big reveal of Talos, in all his glory, is a let down. Tale of the Mummy surprises enough to barely overcome its faults.